Tarantulas in captivity only eat insects. The most common insect is the cricket. They need one or two per week. Some of the larger species might eat six crickets a week. Tarantulas only eat to their needs so there is no need to worry about over feeding them. If the prey is not eaten within a 24 hour span it needs to be removed from the spider’s habitat. Do not worry if the tarantula doesn’t eat, sometimes they will feast and sometimes they will fast according to their dietary needs. Tarantulas need a bowl no bigger than 1/2 an inch deep for water. Fresh water should be given daily. They recieve a lot of their moisture needs from their food. Tarantulas need to molt in order to grow. It can happen every month for young tarantulas and once a year or two when they are an adult. During this time they are most vulnerable and may refuse food for weeks or even months. 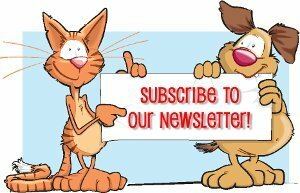 Do not handle a tarantula for at least a week after a molt and do not feed the spider for at least three days after a molt. Even the smallest of insects can potentially harm a tarantula just coming out of a molt. 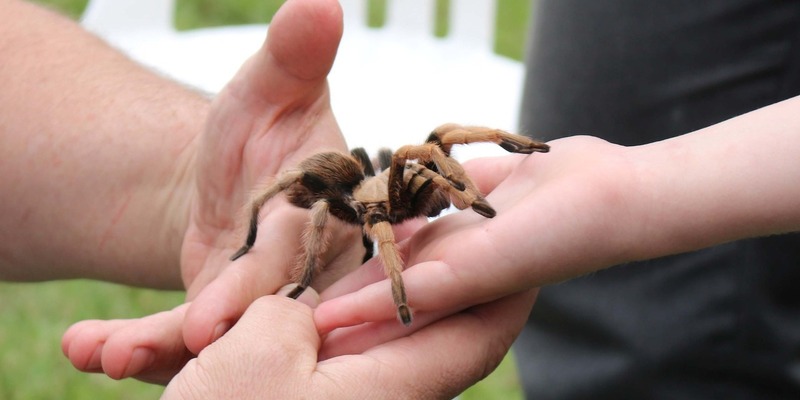 It is recommended that a tarantula live in a glass terrarium container, five to ten gallons in size, with a screen lid. Tarantulas don’t require plants or decorations, but it makes their cage more attractive. Fake plants don’t require light and tarantulas would much rather have a darker cage. 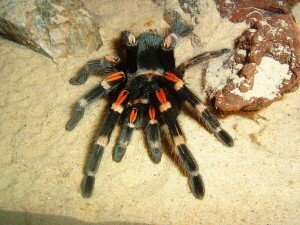 Decorative logs or half-logs help give the tarantula a nice, dark hiding space. One to three inches of any type of dirt that is pesticide and fertilizer free make great substrate for a tarantula. Tarantulas also like some heat in their habitat. This can be achieved by putting a heating pad under only one area of the tank.